At Great River Rescue we are grateful for all the businesses in the area that partner with us. There are dozens of businesses that sponsor events, donate items for raffles, hold supply drives, keep doggy banks, and more. In 2019 , we hope to partner with even more businesses than ever before. We can’t continue to provide high quality care for shelter pets without community support, and we know there are lots of awesome businesses in the community that we want to support too! 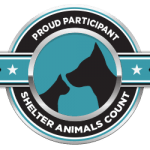 Throughout the year, we will use this webpage to highlight all the businesses that are making a difference for shelter pets in 2019. We will also highlight businesses through our social media platforms such as Facebook and Twitter. Our Facebook page has over 4,300 followers and it is growing which will give our business supporters plenty of exposure! The Furr Bowl is a fun, family-friendly bowling event typically held in the Spring. Participants compete for specially designed bowling pins made by the artists at Gallery North. They are also encouraged to conduct peer-to-peer fundraising and prizes are awarded to our top fundraisers. We are seeking business sponsors for this event. Many businesses support us as “lane sponsors” for $150. Benefits – Large business logo on online registration page, flyer and television ad. Your business will be promoted on our Facebook event page, website, and newsletter. Your business will also be promoted as a Headline sponsor at the event. Benefits – Business logo on online registration page, flyer and television ad. Your business will be promoted on our Facebook event page, website, and newsletter. Your business will also be promoted as a Community sponsor at the event. Benefits – Business logo on online registration page, and Facebook event page. Your business will be promoted at Bemidji Bowl both before and during the event. Donate an in-kind item, coupon, or gift card to be used as a raffle prize at the event. Your business will be promoted at the event. Sponsorship levels for our Fall Harvest Dinner have not been determined yet. This year’s dinner will be held at the new Bluebelle Event Center on October 18. Details regarding sponsorships will be available soon. We are seeking donated items for our silent auction and raffles. Items such as gift cards, apparel, artwork, dog and cat toys, tickets to sporting events, etc. are great for this event. We are also seeking higher value items to be raffled or given out at a live auction. Donors love to give when they know their donations are being matched. Step up and commitment to matching a certain level of donations. We’ll promote your business as a matching donor on our giving site, on Facebook, and in any press releases. Give to the Max Day will be in November. For $50 per hour, Great River Rescue will bring shelter pets to your business to allow your staff time to relax and get re-energized. Dates are limited and need to be scheduled at least one month in advance. Maximum of 3 hours per visit. 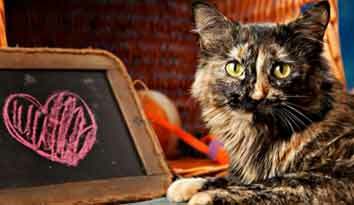 These sponsorship programs give your business visibility at our shelter throughout the year. 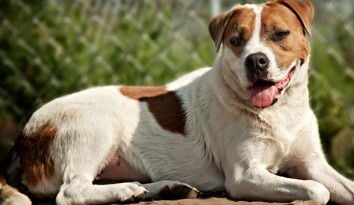 You will also receive a monthly update card with a picture of a shelter pet you are sponsoring. Each quarter, we send out a print newsletter to hundreds of animal lovers in the Bemidji community. It costs about $500 to print and mail this newsletter. 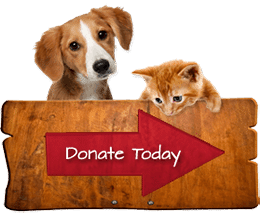 Would we love to recognize your business as a sponsor for our newsletter which allows us to keep more money going directly to animal care needs. The newsletter is currently undergoing a redesign by a professional graphic designer and we are really excited for the new look! 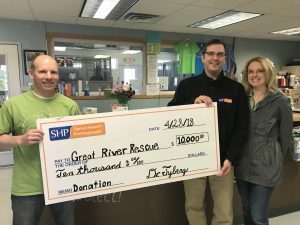 Employee giving program – encourage your employees to use a payroll deduction to donate to Great River Rescue. This is an easy way for employees to give back! Please fill out this short Google Form if you are interested in partnering with us – https://goo.gl/forms/GyPTY1TSHbfuStiG3 As a community organization, we know that we all need each other to be successful. We need community support to continue our mission of saving animals, and we would love to support you in your work! Please call us at 751-7910 or email Brandon at director@greatriverrescue.com to learn more about partnering with Great River Rescue.